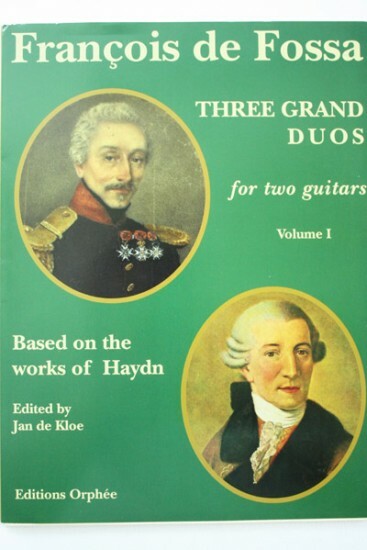 Francois de Fossa Three Grand Duos for two guitars, based on the works of Haydn. The Royal Conservatory in Brussels has the only known copy of the Haydn arrangements for guitar duo by Francois de Fossa. The first of three volumes was published earlier and the other two are in the current edition.‎There are nine duets in total and each duet has four or five movements. Most of the music is taken from Haydn’s early string quartets while a couple of movements are transcriptions from keyboard works or symphonies. While de Fossa calls his collection arrangements, the term transcription would be more accurate in English. Only one movement, the Tema con variazione Hob. XVI:27, differs from the Haydn original to the extent that it qualifies as an arrangement.‎De Fossa transposed most pieces in guitar “unfriendly” keys to C, G, A, or E but more adventurous keys such as A-flat occur also.